Beech Tree Countessa is a legendary fino mare in the Paso Fino breed. She captured the National Championship Title for 4-year Fino fillies in 2001 and then came back in 2002 and won the National Champion Fino Mare, National Champion Fino A/O Mare as well as the Grand National Champion Fino Mare and Fino A/O Mare. Countessa is a proven broodmare, dam of the famed La Contessa de DL, who was 2006 National Champion Fino filly and 3rd in her age group at the 2007 Mundial. 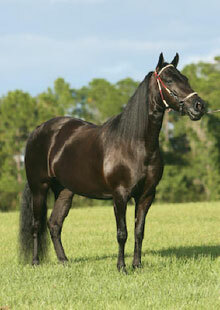 Countessa is well-bred, naturally gaited, quick with outstanding hock action and easy to ride. She passes these talents and her natural collection to her offspring. Embryos are available for sale! By Capuchino (1980): Paso Fino Horse of the Millenium. Classic fino stallion, winner of PFHA Grand National Fino Championship 4 years in a row, also World and International Champion fino stallion. PFHA Top Ten Sire. Sire of Manuela del Conde, Carbonera de Calidad, Sonjaero de La Esmeralda, Ofrenda de Fe, Cafeto del Juncal, Anfitrion del Conde, Chaperona del Ocho, Capitan de La Vitrina, Detalles de Besilu, Prometido de Selecta, Arco Iris de Capuchino, and Aprendiz de Colores, to name a few. Majestad de Santa Cruz by Imperioso. 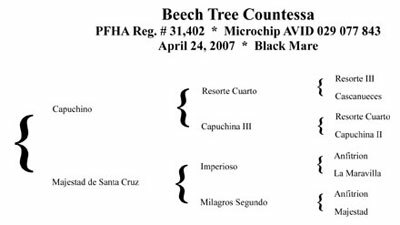 Dam of Beech Tree Valentina, Beech Tree Countessa, Beech Tree Antinia, Beech Tree La Majestad and Beech Tree Squire. Dam of La Contessa de DL, (2006 National Champion Fino filly) and 3rd in her age group at the 2007 Mundial); La Protagonista de DL a beautiful fino mare. Jaranero II del Conde, a black fino colt who is very similiar in looks and mechanics to La Contesa de DL. In addition, he has won several fino championships including the Las Vegas Classic and the Piedmont Classic. Comienzo de Barakat, a beautiful fino colt, who placed 2nd at the 09' Piedmont Classic and 4th at the 09' Nationals. Alternativa de Besilu (7/25/09) an up an coming black filly. Other offspring show great promise, but are now too young to go under saddle. The first four have all been successfully shown in "Fino" at the national level!